As per usual, I am a bit behind on discussing Christmas. Living so far away from our family, we tend to take a 2-3 week vacation around the holidays. We load the entire brood into the car and venture north...usually in the middle of the night. Regardless of the long drive and crazy schedules, we have been having a fabulous time visiting with everyone and celebrating being together. We also celebrated the first Christmas with Preston aware of what was going on. Well, about as aware as any 1 year old can be! 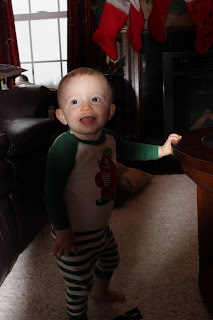 As a result...here is how we spent our Christmas morning! Christmas stockings and tree at Ed and Lorries! First thing Christmas morning. He's not quite into it yet! 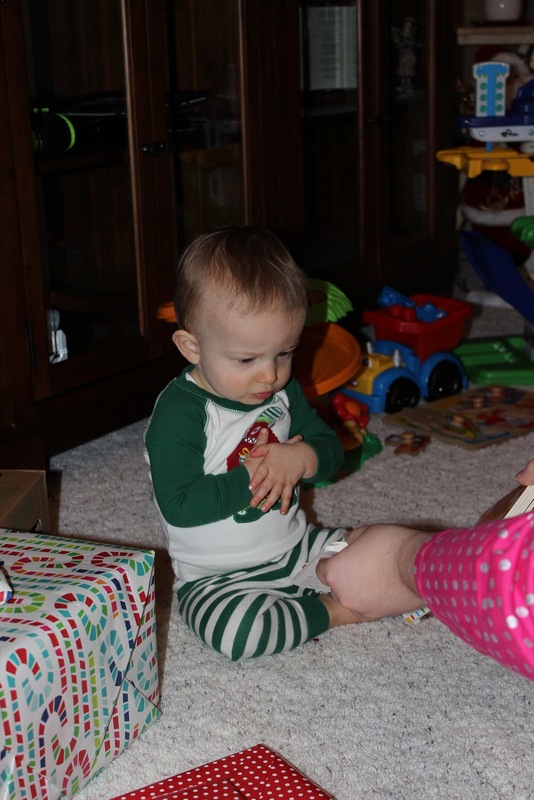 I love how concerned he looks...he's not really into opening presents at this point! That's a little better...books are always fun! This is probably one of my favorite pictures from Christmas. I was playing with the camera settings and just love how this turned out! My sweet baby boy. Here's hoping you and yours had a wonderful holiday season!